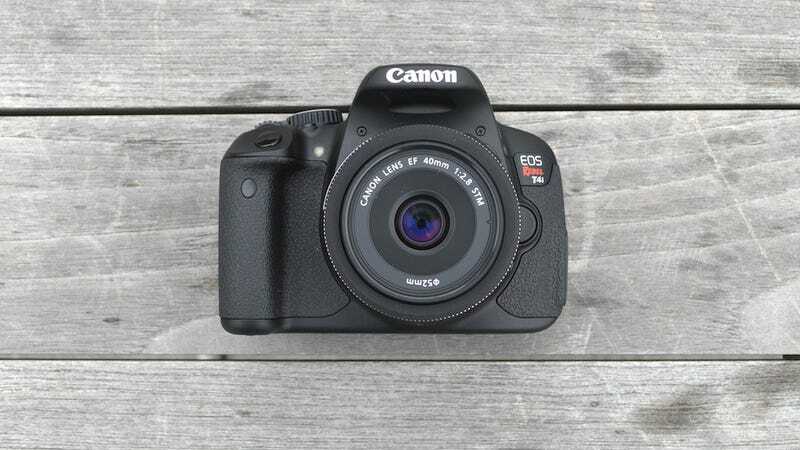 Is the Canon T4i a Future Mirrorless Camera Hiding In Plain Sight? The just announced Canon EOS Rebel T4i brings two industry leading features to the company's budget DSLR line: Continuous autofocus in Live View mode and touchscreen controls. They make the digital rebel easier to use than ever. But these new technologies could also mean that Canon's prepping a long-overdue compact, large-sensor camera line. Is a Canon mirrorless camera imminent? If anything, the T4i confirms Canon's knack for innovation. Still, the company is basically the only one that hasn't stuffed a DSLR's powers into a smaller package without a viewfinder. The market for mirrorless, interchangeable lens cameras has exploded over the last few years because people love getting DSLR image quality from a much smaller body. It's shocking that a player as big as Canon hasn't jumped in yet. Rumors abound, but at this point it's not a question of whether the company will release a mirrorless camera but when. TechRadar points out that the T4i's aforementioned consumer-friendly advancements would be immensely useful in a mirrorless camera. Best of all, it could mean Canon is tending very closely to the details of getting its first mirrorless camera right. Continuous autofocus in Live View mode should make shooting video with the T4i camcorder-easy. But pay close attention to the technology and you see that it doesn't have to be DSLR specific. In Live View and movie mode, the camera's reflex mirror is lifted, and Canon uses a dedicated AF system on the image sensor instead of the independent AF sensor in the camera's mirror box. It's a hybrid system that uses both contrast and phase detection to get superfast, precise autofocus. That's important because it means Canon has built a sophisticated AF system that already works without a mirror. Think about it: By definition a mirrorless camera doesn't have a viewfinder so it's designed to be in Live View all the time. As for the touchscreen, Canon's new capacitative, glass display is unlike the one on any other camera. It's a slicker screen than those on Canon's point-and-shoots, and from what we could see on a pre-production T4i unit, it's more responsive than those on Panasonic's mirrorless line. Adding a touchscreen is helpful on a compact DSLR like the T4i because there isn't a lot of space for buttons. There's even less space for buttons on mirrorless cameras. Getting the most out of a big sensor and interchangeable lenses means taking the time to adjust settings until everything is right. It's crucial, and yet making adjustments on many mirrorless cameras is a pain. The touchscreen Panasonic G-series cameras like the Panasonic GX1 are the exception. One would hope any Canon mirrorless camera would have the T4i's gorgeous display.